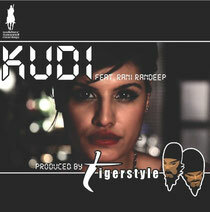 ‘Kudi’ (‘Girl’) is the first release from Tigerstyle's forthcoming new album titled ‘Digi-Bhang’. Tigerstyle's new material showcases the unique direction they are taking, by making use of electronic and synthetic sounds but always fusing with Bhangra, international elements and plenty of bass. The track features the vocals of highly acclaimed female Punjabi singer Rani Randeep and comes with a bunch of intense genre jumping remixes, pure ammunition for all dancefloors. Tigerstyle is one of the few Asian acts to have ever recorded a live session for the legendary late Sir John Peel. They were given the opportunity to showcase material supported by a full band at the first ever BBC Electric Proms in September ‘06, were selected out of 1000s of acts to perform on the first ever BBC Introducing Stage At The Glastonbury Festival in July ‘07 and performed at the 2010 Vancouver Winter Olympics. Previous releases by Tigerstyle were identified as key representations of the worldwide appeal of Bhangra music and have been used on XBOX 360 games. This was the first time that Bhangra tracks had been placed on any interactive game and endorsed the mainstream opinion that Bhangra had finally arrived in the ever-increasing global music market. They have also been working alongside prominent Bollywood music directors, composing and remixing for Indian film soundtracks.